An ASU student browses through several phone applications created by ASU students and alumni on ASU's downtown campus on Wednesday, Feb. 21, 2018. The innovative environment at ASU stretches beyond the classroom and news rankings. Students also lead the charge with breakthroughs, including phone apps. Here’s some of the best apps from ASU students or alumni. Shlacker is a deadline calendar app, invented by business sustainability senior Tad Crother, who came up with the idea for an app that kept track of class deadlines after he attempted to add all his class assignments to his iCalendar. The app is in it’s “proof of concept” phase, Crother said. Shlacker hopes to launch the ASU-only version in the Fall, with some major updates. “One thing we’ve accounted for in the next version … as soon as a teacher changes something, with the new system, it will actually automatically update in the app as well,” Crother said. The app remains free, with the next update having premium upgrade features. Crother said that any students interested in joining the Shlacker team should reach out, and that the company is open to developers or entrepreneurs joining. Pitch is a communications app for ASU students, with public and private channels for students and faculty members to interact in. The app hopes to encourage “collaboration and connectivity,” according to an email from EdPlus student worker Caroline Davies, who works on the app. The app has over 9,000 online users. Senior Product Manager Drew Langhart said in an email to a State Press reporter that the app isn’t currently ready for wide-spread ground use, but students are able to join the app using their ASURite identification. Frenzi updates customers with what restaurants have extra food and when, using notifications from their zip code area. Restaurants can send push notifications when they have extra supply, like donut shops at the end of the night. The app was founded by Ricky Johnson, who graduated in December with a degree in computer system engineering, and Brandon Caffie, an ASU computer systems engineering alumnus. Johnson said restaurants are also using the app to promote discounts or specially priced deals. AirGarage is a parking spot sharing app that allows users to either list their personal parking spots to rent or to rent the spaces themselves. AirGarage will launch an app in the next six months for the Tempe area and will work a little differently than the website. The website focuses on long-term rentals, while the app will work in short-term usage, connecting users to available spots, rather than simply helping them pay for available parking. After expanding to all ASU campuses, AirGarage will move to UA and NAU and plans to go national eventually. 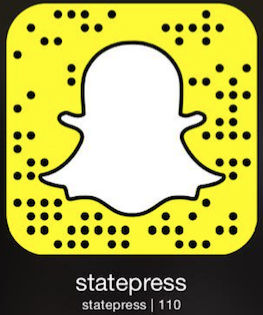 What list of ASU student and alumni apps would be complete without a mention of The State Press app? The app was launched seven years ago and includes updates from the digital desks and The State Press Magazine.